The Gum Ball is where it all started for us here at Dashville. If mum and dad never said yes to letting us host a festival in the front yard back in 2004... who knows what we'd be doing now. The festival is located in secluded bush at Belford, in the middle of the Hunter Valley, NSW. If you like your festivals easy, comfortable, inspiring and cost effective, then we're pretty confident we've got your best option when we launch the 14th edition of the festival come April 2019. 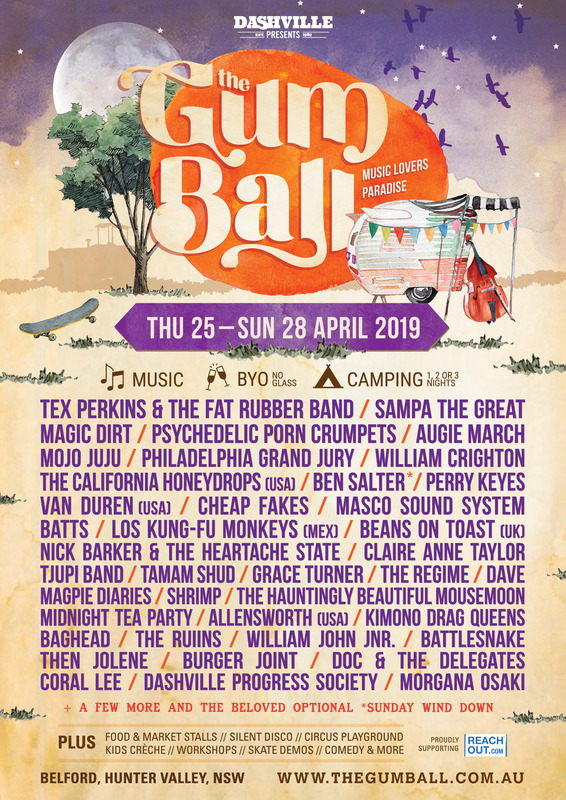 We reckon it's one of those pristine kinds of times where you can escape to a bushland oasis, connect with like-minded people, great music and essential art. Soak up a bit of fresh air, kick back, relax and re-jig. We do our best to have something for everyone, with a focus on providing the ultimate all-age adventure. So for those new to the concept, expect a discovery! Playing times are now out and there's no doubt, the 2019 event is building to be one of our best yet, so grab your tickets before they all go and stay tuned for more news as we inch closer to this laid back beast of a weekend! Check out some videos from previous years!